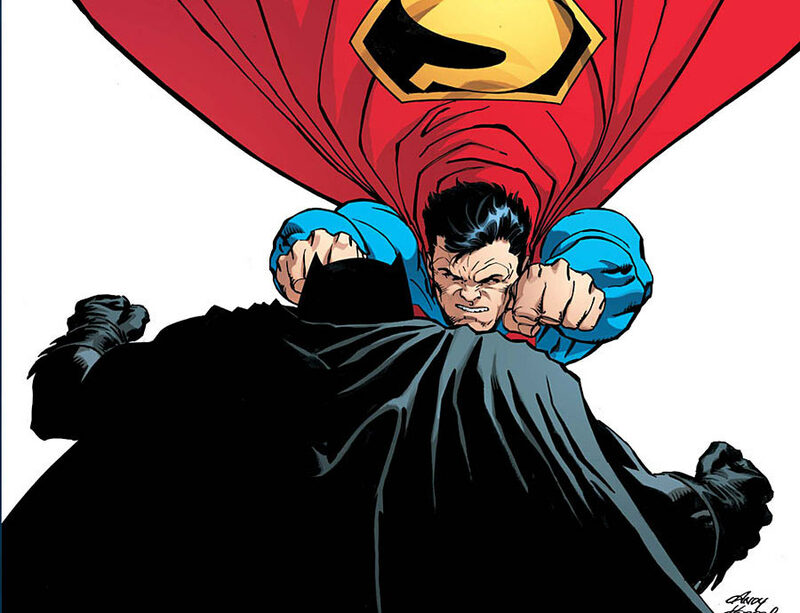 Dark Knight III: The Master Race #5 Review – AiPT! Don’t let the cover fool you, Superman has been taken out of the fight… which leaves Batman up against a bunch of Kryptonians looking to battle. It’s Batman’s show, but is it good? Not that helpful, so I’ll fill you in. Basically Superman has been taken out of the fight due to his daughter backstabbing him, Batman is getting things in order for a retaliation on the Master Race Kryptonians, and the bad guys have asked Gotham to bring them Batman or else they’ll be destroyed. So far this series has run circles around the previous sequel to The Dark Knight by raising the stakes and telling a much more cohesive story. Batman is worse for wear, but the threat is bringing a lot of religious mumbo-jumbo (and some visuals that remind us of terrorism). The story has effectively brought in most of the major DC characters too using the mini-comic format that makes each issue of this series feel extra special and important. The strength of this issue lies with Batman’s captions as he ruminates on what is going on in his city. He’s witnessing mobs of people tear Gotham apart as they seek him out for the Master Race AKA the Kryptonians. Like any good Batman story, we see The Caped Crusader make good use of his resources and plenty of strategy to best his opponent. It just so happens the mob is a crucial part of his strategy and writers Frank Miller and Brian Azzarello build up the anticipation of his strike on the Master Race quite well via these captions. Due to this, it’s extremely satisfying when Batman’s hammer finally strikes. This narrative is broken up with a bit of an adventure for Robin AKA Carrie who – with the help of Aquaman – resolves the whole Superman being stuck in another universe thing. There’s also a clever scene with Flash that’s entertaining too. The mini-comic focuses entirely on Superman’s daughter and is drawn by Frank Miller. This serves as another good aside from Batman’s story in the issue, but also fleshes Lara out presumably since she’ll be getting her comeuppance in the next issue. It certainly brings into question her dual nature of being both Kryptonian and Amazon, reminding us there’s a conflict within her that might be used to free her from working with the Master Race. Adam Kubert draws yet another great issue with inks by Klaus Janson. The portion of the story involving Aquaman particularly look epic in nature and remind us this hero is formidable and from another world. There are some nice throwbacks to The Dark Knight Returns too, like Batman inside his tank looking at all the sharp edged monitors, and his cavalier smirk in the Iron-Bat suit. Hell, even the famed spiky boot makes an appearance! There’s some great use of color by Brad Anderson too, especially in the final pages as Batman employs a secret weapon. The art by Frank Miller is solid, at least when it comes to the characters; they look rigid and sharp with an edge to them that reminds you of his good old days for sure. A “crack” heard round the world. That said the mini-comic suffers a bit due to the lack of detailed backgrounds and some almost unfinished-looking panels by Miller. It’s a character focused story for sure, but the art is too basic at times and almost as if it was drawn for an even smaller format. Shrink the mini-comic down to wallet-size and it’d look better. Some great captions to be had. The story in Dark Knight III: The Master Race is rounding the corner to its finish which means a hell of a lot of action and the tide finally beginning to turn in favor of the heroes. That means big reveals, epic scenes, and an adventure you can root for. Batman’s captions and broodings on the proceedings steal the show however, reminding us the older and more brutal Batman might just be the best.